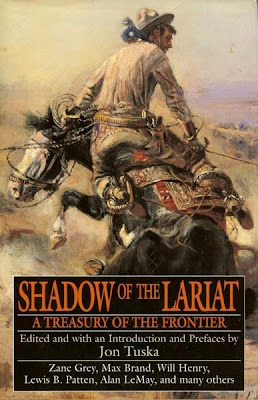 Shadow of the Lariat - Jon Tuska, ed. Notes From Texas -- W.C. Jameson, ed. The first science fiction novel I remember reading was HAVE SPACESUIT – WILL TRAVEL by Robert A. Heinlein. After that I read a lot of young adult SF, by Heinlein, Isaac Asimov (the Lucky Star books), and the various hands who wrote for the Winston SF line, the one with those great endpapers. Back in the Nineties, Tor Books tried to recapture some of the magic of those old YA books by starting a line called Jupiter Novels. These featured younger protagonists and lots of space adventure. To launch the line, they chose the novel HIGHER EDUCATION by Charles Sheffield and Jerry Pournelle. I had read quite a bit of Sheffield’s work and liked it, and I’d enjoyed some of Pournelle’s collaborations with Larry Niven, although I don’t think I’d read any of his solo work (and still haven’t, as far as I recall). So I read HIGHER EDUCATION and liked it a lot. Sheffield wrote several other Jupiter Novels, which constitute a series only in their similar tone and marketing; other than that they’re stand-alones as far as I can tell. And then the Jupiter novels went away, probably because they didn’t sell as well as the publisher had hoped. By that time, I’d read another of Sheffield’s novels, THE BILLION DOLLAR BOY, and enjoyed it, too. 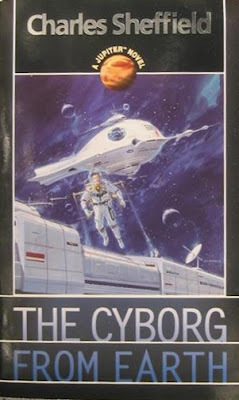 Which brings us at last to THE CYBORG FROM EARTH, one of the Jupiter Novels I hadn’t read until now. The young hero (probably in his early twenties, although his exact age is never specified) is Jefferson Kopal, a member of an immensely wealthy and powerful family that builds all the spaceships for the Space Navy. All of the Kopals are expected to serve in the Space Navy before becoming part of the family business, but unlike all his dashing, athletic, ultra-competent cousins, Jeff is a screw-up and misfit (as the heroes of YA novels nearly always are), who gets into the Navy by the skin of his teeth. And then promptly, you guessed it, screws up and gets caught in the middle of an outer space rebellion, as some of the colony worlds try to break away from the Solar System government. Before this book is over, you get some space battles, some political intrigue, a little romance, and the hero’s discovery that, hey, he’s not such a screw-up after all. There’s also a big plot twist near the end, concerning the true identity of one of the characters, that’s telegraphed ‘way, ‘way early, and pretty heavy-handedly at that. I didn’t think this novel was as good as HIGHER EDUCATION or THE BILLION DOLLAR BOY because it never rises above that predictability. However, Sheffield’s prose is nice and smooth and does a good job of explaining the science that’s tied in with the plot. And even though the big revelation at the end comes as no surprise, it’s still fairly satisfying to see it play out. I liked the book enough so that I’ll read the other Jupiter Novel by Sheffield that I haven’t read, PUTTING UP ROOTS, but I’m not going to get in any hurry to do so. This massive anthology claims to be a tribute to the pulp magazine LARIAT STORIES, but only five of the twenty-two stories it contains actually appeared there. The others all come from various pulps and slick magazines, although some of those authors also appeared in LARIAT STORIES from time to time. Regardless of where the stories first appeared, though, most of them are pretty good, making this a worthwhile collection. To me, any book that includes stories by Walt Coburn, Max Brand, T.T. Flynn, Les Savage Jr., and Lewis B. Patten is likely going to be worth reading, and all their entries in this volume are top-notch, with Savage’s novella “The Beast in Cañada Diablo” (which was also reprinted in a Leisure paperback of the same name) being particularly outstanding. I also liked the stories by Eugene Cunningham, Luke Short, Barry Cord, Frank Bonham, Steve Frazee, Peter Dawson, and D.B. Newton. Newton’s “Reach High, Tophand!” is also one of the best stories in the book, with an unlikely but very likable hero. There were a few stories I didn’t like, but that’s to be expected in a book of this size. Jon Tuska provides the introduction and notes for the individual stories, but if you’ve ever read any of the various Leisure/Five Star/Thorndike collections of these authors, you’ve seen all of that material before. I enjoyed SHADOW OF THE LARIAT a lot. It’s an almost perfect collection of stories to read between novels, which is the way I like to read an anthology. I’m a sucker for sword-and-sorcery movies, and I guess this one counts since it has plenty of hacking and slashing and an evil wizard and some monsters. Jason Statham plays Farmer, who does just that, living peacefully on a farm in the kingdom of Ehb with his wife and young son. Then a horde of monsters known as the Krug sweep through the area, burning and killing, and Farmer winds up having to abandon his peaceful life in order to seek revenge and pursue the Krug to rescue some prisoners they’ve taken. Yep, the first third or so of this movie is actually a Western, in the same way that Robert E. Howard’s story “Beyond the Black River” is a Western. Just substitute “homesteader” for “farmer” and “Comanche” for “Krug”. Farmer’s even got an old galoot sidekick, played by Ron Perlman. On the plus side, I’ve liked Jason Statham in everything I’ve seen him in, and his screen presence and athleticism serve him very well here. He makes a believable sword-and-sorcery hero. Old pro John Rhys-Davies is fine as always as a good wizard. The special effects are okay, and the frequent action sequences are staged so that you can usually tell what’s going on, always a good thing where I’m concerned. This is a reasonably entertaining film that could have been a lot better, even with the oddball casting of some of the roles, if the script had contained even a single twist or surprise. But it’s worth watching for the swordplay, if you like that sort of thing – and we all know that I do. I didn’t really know anything about this movie when we started watching it. I vaguely remember seeing the YA novel it’s based on in the stores, but that’s it. So I really had an open mind about it. The set-up is pretty standard: recently-divorced (or in the process of getting a divorce; it don’t think it’s ever made clear which) mom and her three kids – teen-age daughter and adolescent twin sons – move into a creepy old house belonging to the mom’s crazy old aunt who’s now in a mental institution. One of the boys finds a hidden dumbwaiter that leads to a hidden room in which he finds an old book written by the crazy old aunt’s father, Arthur Spiderwick, who disappeared under mysterious circumstances. 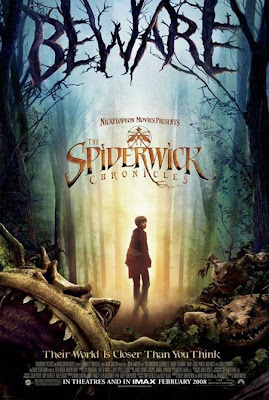 Strange things begin to happen, nobody believes the boy at first, but before you know it, all three kids are in danger and the old house is under siege from a horde of supernatural creatures who want Arthur Spiderwick’s book. Turns out the crazy old aunt isn’t so crazy after all. A lot of you probably know the name Hopalong Cassidy (well, fewer than knew it fifty or sixty or seventy years ago when the Hopalong Cassidy movies and TV show and comic books were hugely popular), but I’m guessing that not many of you have read the Hopalong Cassidy novels by Clarence E. Mulford. The gritty, somewhat profane Hoppy character in the books was considerably different from the clean-cut movie hero played by William Boyd. For the record, I like both versions just fine. 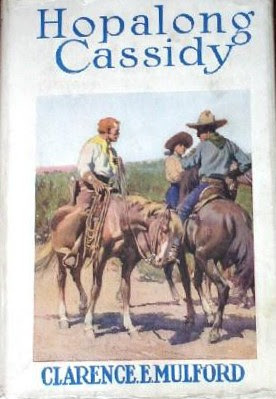 HOPALONG CASSIDY isn’t the first book in the series, but it’s my favorite. I read it for the first time during the summer I turned 11, which was a great time to do so. It has some of that mushy love stuff in it, as Hoppy meets and falls for a girl named Mary, if I recall correctly. Mainly, though, it’s about fighting rustlers who are after the Bar-20 cattle (Hoppy doesn’t own the Bar-20 ranch in the books, he just works there), and there are gunfights galore. Those shootouts take a back seat, though, to the final battle between the Bar-20 cowboys and the rustlers, who are holed up on top of a mesa. I’m going by memory here because I haven’t reread the book in a number of years, but it seems to me that this epic conflict takes up something like the final hundred pages of the book and approaches Homeric heights before it’s over. My blood’s racing a little faster just thinking about it and remembering what it was like to read it for the first time when I was eleven years old. I’ve read it a couple of times since then and remember enjoying it both times, although it’s hard to match that first thrill. Mulford was an Easterner who hadn’t been to the West when he began writing these yarns, but he was acquainted with genuine Westerners and was a diligent researcher, eventually amassing a card file with more than 10,000 entries covering Western history, geography, language, weapons, etc. His first Cassidy novel, BAR-20, is a fix-up of magazine stories published in 1907, and the characters continued appearing in novels and stories until Mulford’s death in the Forties. He also wrote a series about a rancher and deputy sheriff named Bob Corson, as well as several stand-alone Western novels. I haven’t read everything he wrote, by any means, but I’ve read quite a bit and enjoyed all of it. Yes, the prose and the plotting are a little old-fashioned, but if that doesn’t bother you I don’t think you’ll go wrong with just about anything by Clarence E. Mulford. A number of his books were reprinted by Forge during the Nineties, so they’re not that hard to find. 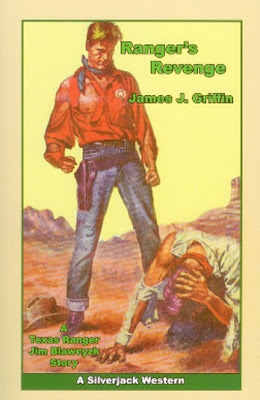 RANGER’S REVENGE is my buddy Jim Griffin’s latest Texas Ranger novel, and it’s a top-notch traditional Western. After creating a new character in his last novel, the also very good BIG BEND DEATH TRAP, Griffin brings back Jim Blawcyzk in this book. Blawcyzk isn’t really working for the Texas Rangers this time, though. In fact, he winds up on the wrong side of the law with the Rangers after him for part of the book, because he takes off his badge and goes off on his own after the gang that attacked and possibly murdered his wife and son. (No spoilers there; it happens early on.) As a result, RANGER’S REVENGE is a little grittier than Griffin’s earlier books, but it has the same fine action scenes, interesting settings, and welcome touches of humor. I’ve read all of Jim’s books, and he really is getting better with each one. This one has a heck of a good cover, too. It's available from Amazon, from the publisher, or from Jim's website. Chris Pratt (Joseph Gordon-Levitt) is a star high school athlete with a beautiful girlfriend and everything going for him. Then a car wreck that’s his own fault leaves him with a head injury that forces him to relearn nearly everything about his life. He winds up living with a blind roommate (Jeff Daniels) and working as a janitor in a small-town bank in Kansas. With a set-up like that, this movie could have easily been a heartwarming, Seventies movie-of-the-week style drama . . . but no. Instead, writer-director Scott Frank turns it into a gritty, very well-written crime yarn, as a gang of crooks plays on Chris’s diminished capacity to enlist him in their efforts to rob the bank where he works. How it all plays out from there isn’t all that surprising, but it’s well-acted, well-directed, and extremely suspenseful in places. 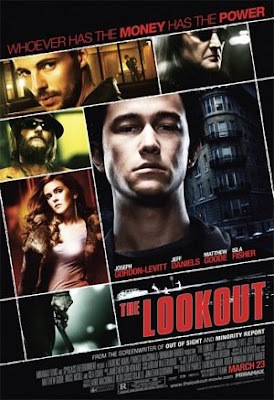 THE LOOKOUT is one of the best films I’ve seen so far this year, and if you haven’t seen it yet I highly recommend it. Okay, I'm trying to find out the title of a fantasy (or possibly science fiction) novel, probably published during the Nineties, set in a vaguely medieval world, in which a young couple who are both archeologists travel around to various countries, one of which is inhabited by frog-people. If this sounds familiar to any of you, I'd appreciate any leads. You can respond in the comments or feel free to email me directly. Some of the first comic books I remember reading are issues of BATMAN from the Fifties, and here I am fifty years later still reading about Batman. Or The Batman, if you prefer. With the new movie opening this weekend, it seems appropriate, although I probably won’t actually see it until it comes out on DVD. The trade paperback BATMAN AND SON reprints eight issues of the monthly BATMAN comic book, a storyline that introduces Damien Wayne, the son of Bruce Wayne and Talia, the beautiful daughter of international criminal Ra’s al Ghul, who’s been one of the major villains in the DC universe for the past thirty years or so. Batman knew nothing about the boy, who was raised to be a weapon for use against him, but not everything goes according to Talia’s plan. As the story plays out, things take a late turn that left me sort of shaking my head in confusion. Maybe there’ll be a follow-up volume later on. Despite that, I thoroughly enjoyed BATMAN AND SON. The script by Grant Morrison is tight and fast-paced and evocative when it needs to be. The art by Andy Kubert is very good, including one of the covers from the original series that’s a collaboration between Andy Kubert and his dad Joe that’s excellent. Joe Kubert, of course, is one of the all-time great comic book artists and one of my favorites going back (again) nearly fifty years. 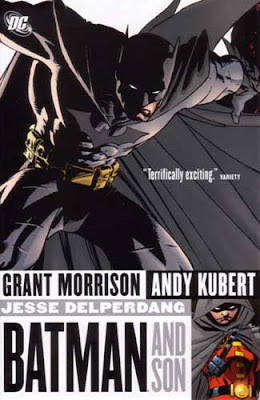 As a bonus you get a prose short story featuring the Joker, also written by Grant Morrison. If you’re a comic book fan in general or a Batman fan in particular, I highly recommend this volume. Although he was a prolific author, Davis Dresser wrote only a few books under his own name, and I believe all of them were Westerns. Best known as Brett Halliday, the creator and principal author of the Mike Shayne series, Dresser wrote quite a few Westerns as well, some under the house-name Peter Field (the Powder Valley series), some as Don Davis (the Rio Kid books, reprinted by Pocket Books in the Sixties – but these are not about the pulp character known as the Rio Kid, whose adventures were chronicled by Tom Curry, Walker Tompkins, and others), and three under his own name, two of which feature good-natured cowboy/detectives Twister Malone and Chuckaluck Thompson. 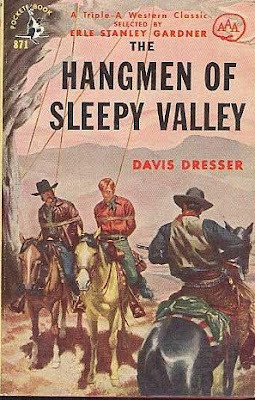 THE HANGMEN OF SLEEPY VALLEY opens with Twister and Chuckaluck on their way to Mexico, but in West Texas they run across a bizarre scene: a man being hanged by a group of four masked vigilantes . . . and the hoods worn by the vigilantes have only one eye hole each. Twister and Chuckaluck exchange shots with the hangmen and then discover that the hanged man is still alive. They cut him down, take care of him, and find out that the gang of lynchers has been terrorizing Sleepy Valley for months, singling out ranchers and then hanging them if they refuse to heed the gang’s warnings to leave the valley. Of course, being the heroes that they are, Twister and Chuckaluck aren’t going to stand for that and decide to hide out the man they rescued so the hangmen won’t realize that he’s still alive. They take over the fellow’s ranch and proceed to go after the gang, leading to plenty of ridin’ and shootin’ before the identities of the masked hangmen are uncovered. While that basic plot is pretty standard, Dresser throws in some nice twists along the way. Nothing on the level of complexity to be found in his Mike Shayne novels, to be sure, but still, I didn’t see all of them coming. What I really liked about the novel are the bizarre little touches like the one-eyed masks worn by the hangmen (Dresser had only one eye, by the way, and his author photos always show him wearing a black eye patch and looking rakish) and the way that he plays against reader expectations with some of the characters. There’s more to Twister and Chuckaluck than you’d think at first, and that’s true of some of the other characters, too. One word of warning: nearly everybody in this book speaks in heavy “pulp Western” dialect, what I sometimes call “yuh mangy polecat!” dialogue. That was the fashion of the times (the book was originally published by William Morrow in 1940 and reprinted by Pocket Books in 1952 – with an introduction by Erle Stanley Gardner), although some authors were more inclined to it than others. Dresser sort of overdoes it, but I got used to it. Some readers might not. THE HANGMEN OF SLEEPY VALLEY is a solidly entertaining Western of its era, unreprinted since 1952 and surely forgotten by most. But as a friend of mine who also read the book recently told me, “You can’t go wrong with masked hangmen.” I agree. One talent shared by most pulp heroes was the ability to disguise themselves at a moment’s notice so well that their best friends wouldn’t know them. Secret Agent X was probably the absolute master of this art, leading him to be billed at times as the Man of a Thousand Faces. The thing about Secret Agent X is that he’s always in disguise. No one ever sees his real face, although there’s usually a mention of it in the novels. 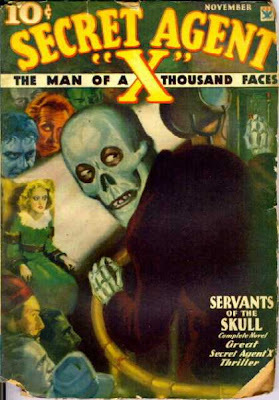 In SERVANTS OF THE SKULL, from the November 1934 issue of the pulp SECRET AGENT X, the Agent pulls off several disguises as he infiltrates a gang of kidnappers led by the evil mastermind known only as The Skull, who wears a red, hooded robe with a skull mask concealing his face. The Skull has established a headquarters underneath Manhattan with numerous hidden entrances and has recruited a gang of crooks who are experts at their various specialties to pull off the crimes he plans. If he succeeds, The Skull will reap a payoff of ten million dollars and several leading financiers and industrialists will be reduced to broken, gibbering hulks. This plot is standard stuff, and most readers will figure out The Skull’s real identity with no trouble at all. 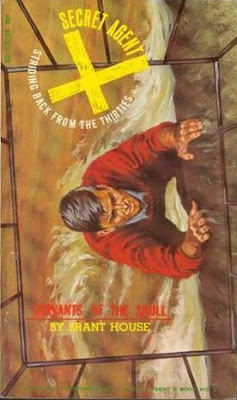 What makes this a pretty good pulp novel, though, is the atmosphere of claustrophobic horror the author – in this case, Emile C. Tepperman writing under the house name Brant House – creates as “X” carries off his dangerous impersonation in the very depths of The Skull’s lair. Tepperman, about whom very little is known, was an inconsistent writer. SERVANTS OF THE SKULL is one of his better efforts, good enough that I recall reading an earlier paperback reprint of this book back in the Sixties. I just read it again, and it holds up fairly well. An inexpensive reprint of it will be available later this year from Beb Books. I wouldn’t recommend it to everybody, but if you’re a pulp hero fan I think you’ll probably find it pretty enjoyable. I did. In my post about this book the other day I neglected to mention the editor, W.C. Jameson, and my apologies for that. W.C. did a great job putting the book together and provides a fine autobiographical introduction that serves as an extra essay. I’ve read the other essays now – in fact, I could hardly put the book down – and enjoyed all of them. I consider Judy Alter, Elmer Kelton, James Ward Lee, and Carlton Stowers friends, so naturally I was glad to learn more about them and how they came to be not only writers, but Texas writers. All the other essays were interesting, too, especially the common themes that emerged. Almost everyone mentions the desire to write emerging at a young age, as well as the desire to write about Texas and present it realistically. Goodness knows, as far as my own work goes most of my characters and plots are a lot closer to fantasy than reality, but the settings of the stories are as close to accurate geographically as I can make them, and I strive for realism in the way people talk and the trappings of everyday life. I’ve never forgotten reading an article by “Ellery Queen” about the work of Dashiell Hammett in which he discusses how fanciful most of Hammett’s plots are, but how what made them groundbreaking at the time was the realistic way in which those fanciful plots were presented. I try to do the same thing. Not that I’m comparing myself to Hammett in any other way, mind you. But now I’m rambling (another tendency of mine) and what I really wanted to say is that NOTES FROM TEXAS is a fine book, and anyone who’s interested in writers and writing ought to enjoy it. I wasn’t really expecting much, but I thought this movie was hilarious and wound up thoroughly enjoying it. 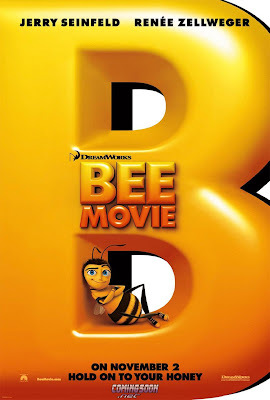 There’s a lot of sharp, well-written satire and a ton of jokes that go by so fast I might have missed some of them, and the voice cast led by Jerry Seinfeld and Renee Zellweger do a great job. I don’t have much else to say about it except that if you haven’t seen it yet, it’s well worth watching. 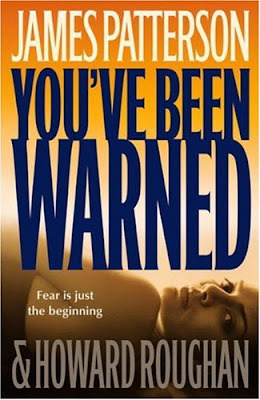 A while back I read the first collaboration by James Patterson and Howard Roughan, HONEYMOON, and thought it was pretty good, so I was willing to give this one a try. It has the usual twisty Patterson plot – nanny/aspiring photographer Kristin Burns is having an affair with the husband of the wealthy couple she works for, with a lot of deception and potential murder thrown in – but the book has some elements in it that smack of horror fiction, too, such as the ghosts who keep showing up and the thousands of cockroaches that invade Kristin’s apartment. The authors keep this one racing along in the usual fast-moving style with ultra-short chapters and lots of surprises. However, despite those surprises I wound up feeling that the book was missing a vital twist or two that should have been there, so at the end I said, “That’s it?” I enjoyed it enough that I’d read another one by Patterson and Roughan (and it’s already out, a novel called SAIL), but I’m not going to get in any hurry to do so. Regular readers of this blog know of my fondness for the Western comics featuring disfigured bounty hunter Jonah Hex. 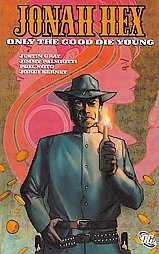 ONLY THE GOOD DIE YOUNG is the latest trade paperback reprinting six issues of Hex’s current title, and like all those before it, it’s an excellent collection of gritty, violent Western tales written by Justin Gray and Jimmy Palmiotti. These are mostly stand-alone yarns, although there’s a slight connection between a couple of them, and a couple of others refer to things that happened in earlier issues. There are even guest appearances by Bat Lash and El Diablo, who shared the billing with Hex in the late, great comic WEIRD WESTERN TALES. Those first appearances of Jonah Hex appeared more than thirty-five years ago, making him one of the most durable Western characters in the history of comics, although stories featuring him haven’t been published continuously during that time, of course. Still, it’s good to see him still around after all these years. I don’t care for some of the art in this collection as much as I did in others, but I’m always more interested in the stories than I am in the art, anyway, and all the stories worked just fine for me. If you’re a fan of Western comics, you should definitely consider picking up these trade paperbacks or the monthly issues of JONAH HEX. TCU Press has just published NOTES FROM TEXAS: ON WRITING IN THE LONE STAR STATE, which includes my essay "Barbarians, Cowboys, and Private Eyes: How I Became a Texas Writer". It's supposed to be an essay about Texas's influence on my writing, but there's a fair amount of autobiography in it, too, some of it cribbed from posts I've done here about the early days of my career. The other authors included are Judy Alter, Robert Flynn, Don Graham, Rolando Hinojosa-Smith, Paulette Jiles, Elmer Kelton, Larry L. King, James Ward Lee, Clay Reynolds, Joyce Gibson Roach, Red Steagall, Carlton Stowers, and Frances Brannen Vick. Pretty good company, I'd say. I've glanced at the other essays and they all look interesting. I'm always fascinated when writers talk about what they write and why. Sure, the special effects are top-notch in this movie. It looks great, with lots of sweeping, majestic vistas in addition to the wooly mammoths and the other SFX creatures. But I wasn’t sure about the story, which finds a young hunter from an oddly heterogeneous tribe (some of them look Caucasian, some Native American, some even a little Chinese) setting off on a quest to rescue the girl he loves from a gang of slavers who have carried her off, along with numerous others from the hero’s village. It’s a really generic set-up, and the rest of the movie doesn’t vary much from those constraints, either. But somewhere along the way I got kind of caught up in it anyway and wound up enjoying it quite a bit. Forty-five or fifty years ago this would have been a cheaply-made drive-in movie rather than a big-budget special effects epic, but it still has a little of that good-hearted drive-in feel to it, especially in the scenes where the hero leads the slaves in an uprising against their evil masters. By the way, the origins of the bad guys are hinted at but not really resolved. Are they Egyptians, Atlanteans, space aliens . . . or all of the above? 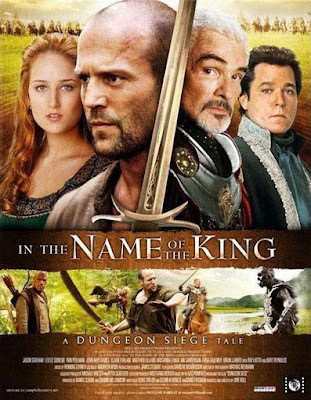 Most of the complaints I’ve read about this movie say that it’s historically inaccurate. I’m not sure how much historical accuracy you can expect from a movie called 10,000 BC. The opening narration even makes a point of saying that some truths are lost to time. Anyway, here’s the way I look at it: You’ve got your sword fights, you’ve got your spears and arrows flying through the air, you’ve got noble, self-sacrificing heroes and sneeringly evil villains, you’ve got your giant birds, you’ve got two, count ‘em, two wooly mammoth stampedes . . . What the heck else do you want in a movie that’s just out to show you a good time? 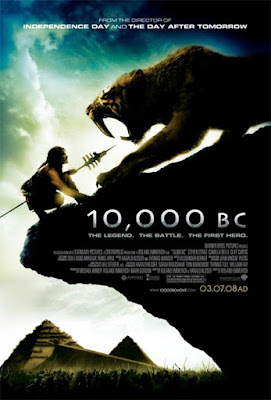 I think 10,000 BC succeeds admirably in that goal. This movie is at least a decade old, but I didn’t see it when it came out, so it was new to me. 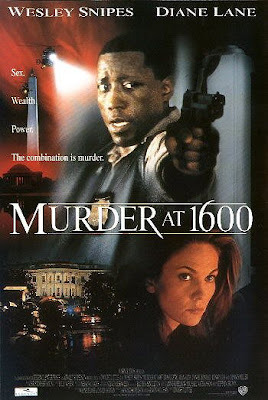 If you can buy Wesley Snipes and Dennis Miller as Washington, D.C., homicide cops and the always gorgeous Diane Lane as a Secret Service agent, it’s a pretty passable thriller about a gory murder inside the White House, followed by all the political intrigue of the cops trying to solve the case while various Washington insiders are trying to cover it up. The supporting cast is good, the action sequences are fairly exciting, and while the plot twists get pretty silly toward the end, it never quite reaches the level of eye-rolling ludicrousness. And I stayed awake all the way through it, which regular readers of this blog know is never a given. Overall, I liked it and had a good time for a couple of hours watching it. 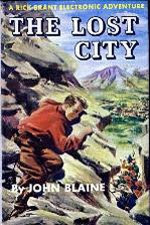 When I was a kid, I read the Hardy Boys books like everybody else, but my favorite series books along those lines, far and away, were the Rick Brant Science-Adventures by John Blaine. One summer many years ago, I picked up the first two of these in a department store in Odessa, Texas, while visiting relatives who lived near there. I read the first one, THE ROCKET’S SHADOW, and met Rick Brant, the sixteen-year-old son of a scientist who lived on an island off the New Jersey coast called Spindrift along with his family and several other scientists. Early on in that book, Rick runs into an ex-Marine who’s several years older named Don Scott (known as Scotty), who gets a job working for the scientists as a pilot. Rick and Scotty become best friends and are soon mixed up in a dangerous situation as some mysterious enemy is trying to sabotage the efforts of the Spindrift group to win a very valuable grant of some sort (I haven’t reread this book in several years and the details are a little fuzzy). What I do remember is that Rick and Scotty go tearing around in an airplane and getting in fights with the bad guys, and I was utterly enthralled. This was my meat. So I immediately read the second book, THE LOST CITY. It was even better. The whole gang heads for the Himalayas, where they’re going to set up a radar link to bounce signals off the Moon or some such. Naturally, there’s a gang of villains out to stop them. And yep, just as you’d guess from the title, there’s a lost city inhabited by descendants of the Mongols. Yowza. This stuff was crack to my twelve-year-old brain. I couldn’t get enough, and eventually I read the entire series, which ran for twenty-five books. Rick and Scotty got mixed up in all sorts of scientific-themed adventures all over the world, battled spies, saboteurs, and crooks, and generally had themselves a fine old time. So did I, reading them. A few years ago I came across some of the books in the local library, including THE ROCKET’S SHADOW, so of course I had to reread them. I was a little worried, because sometimes the great loves of our youth aren’t quite so bright and shiny when we encounter them again. The Rick Brant books, though, hold up. Do they ever. While the sense of wonder that gripped me while reading those first two books all those years ago wasn’t there, I think I appreciated even more how well-written they are. Even though they were aimed at the same readership as the Hardy Boys, the Rick Brant books are considerably grittier. Characters actually die occasionally in them. For the most part they take place in more exotic locations, and the plots are more off-beat, too. At one point I had heard a rumor that Lester Dent, the creator and primary author of the Doc Savage series, also wrote the Rick Brant novels, but that turned out not to be true. 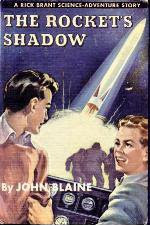 The actual author behind the John Blaine pseudonym was Hal Goodwin. But it would be an easy mistake to make, because the Brants are filled with the same sort of scientific gimmicks and two-fisted, globe-trotting adventure as the Doc Savage novels. I don’t know that the Rick Brant series is actually forgotten – there are several websites and at least one Yahoo group devoted to it, and reprints of the books are available – but it’s certainly not very visible in the public consciousness anymore. The books might be a little dated, of course, for young readers today – okay, a lot dated – but I can’t help but think there are still some adventure-craving kids who would enjoy them a great deal. I’ve been a fan of Steve Martin’s work ever since he was writing for the Smothers Brothers and appearing occasionally on their TV show, which was more years ago than I like to think about. 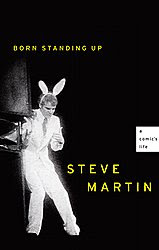 BORN STANDING UP, his new memoir about his childhood and his years as a stand-up comic, is well-written and entertaining, as you’d expect. It’s not a particularly funny book, however, which is not a knock against it. And there are certainly a few laughs when Martin talks about particular bits or routines from his act. What really surprised me was how much of it I remembered. I must have seen him a lot on TV. I enjoyed the book, which ends with him giving up stand-up comedy in 1981 as his movie career was beginning. If he ever feels like writing another memoir about everything that happened after that, I’m sure I’ll probably read it.